How would you improve Target? Students in the Business Policy and Strategy course tried to answer that question as they participated in the Target Challenge this semester, working in teams to develop strategies to improve or enhance the shopping experience. Teams worked with representatives from Target, who presented project options, answered student questions, and judged final presentations. 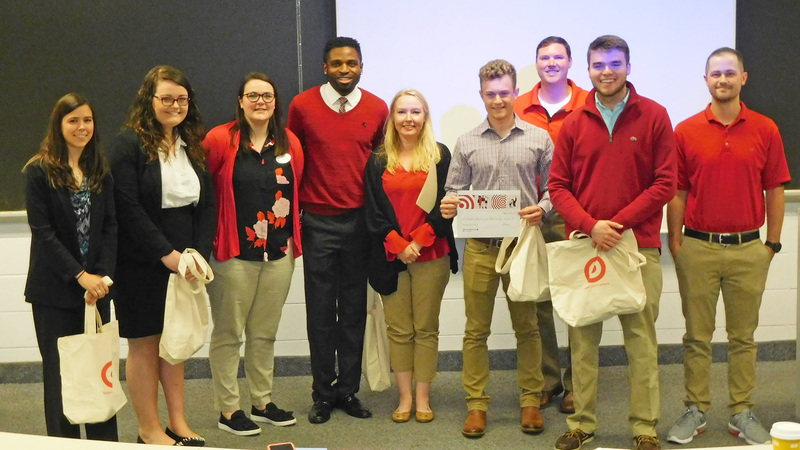 The winning team received a $2,000 award from Target, to be split among team members. The winning team this year was Andrew Dietz, Jennifer Hopkins, Joel Kamuabo, Matthew Scott, and Emily Woods. This group proposed creating a cashier-less system, similar to the AmazonGO convenience store in Seattle. The “TargetGO” concept would leverage a brand-new technology developed and in late stages of testing by AiFi, a Silicon Valley tech startup. The team executed an exceptional research study, collecting 347 usable responses from an online survey, justifying the wide appeal of the idea among different demographics and the fit between the idea and Target’s brand promise of “Expect More. Pay Less”. The team also made a strong argument for the redesign of the cashiers’ job, rather than advocate for layoffs to cut cost. Target executives commented that the team’s idea extends their existing efforts to improve checkout efficiency and redefine the role of the cashier. They were very impressed with the high quality of the team’s work.